AUNG SAN SUU KYI COMPLICIT IN HER SILENCE -- Ironically, Burma's long persecuted opposition party, "the National League for 'DEMOCRACY'", and its Leader - the infamous Aung San Suu Kyi (released in November, 2010 after 21 years under house arrest) - have FAILED to take a stance or any action on this act of GENOCIDE, with many members of this very so-called "democratic" party actually supporting the GENOCIDE of the Rohingya (after having ironically fought for "democracy" for decades). IF YOU'RE WONDERING HOW YOU CAN HELP -- PLEASE DO A ***MASSSSSS*** SEND OUT OF THIS MESSAGE TO ALL COMMUNITY ORGANISATIONS AROUND THE WORLD THAT YOU KNOW, independent of religion, race, ethnicity, politics, etc..
Rima le Drifter hey guys, i've just confirmed a GROUND PRESENCE of an NGO providing AID in Arakan state to the ROHINGYA people. given the Burmese government has PROHIBITED AID from getting through, bar some Turkish AID (i believe 3 shipments to date). eighbor. She was a pregnant mother of three. Her name can be translated as Gentle. They made it to an area where they are relatively safe and set up a simple shelter for themselves there. The following letter was received from @aungaungsittwe the only Rohingya refugee tweeting daily updates from the ground in Burma/Myanmar. I am a refugee; a victim of the Burmese regime and Rakhine authority. I have been writing articles for Tim King of Salem News since June regarding the violence in the Arakan State. We the Rohingya people welcome you warmly and are highly grateful for your visit to our country; it is essential for the transition to democracy in Burma. When you were elected the first time, I was one of the happiest people because it signified a new page not only in American history but also in modern historical records, an expansion of the definition of democracy, a model for a multi-cultural society. After the Second World War, Cold War and other ideological clashes that caused the loss of millions of lives all over the world, natural disasters swept away the lives of millions more and an increase in the world's population saw a thirst for the pure water of peace and justice. Ultra-nationalism, racism, fascism, communism, terrorism, socialism and dictatorship are nowhere welcomed by modern man. The majority of scholars believe that democracy is the best solution for us all. Increasing populations, advancing technology, shrinking resources, access to information and knowledge plus competing economies now challenge world leaders to solve various problems. It is time now for world leaders to reflect on their capacity regarding world peace and justice. The United States of America became a single superpower which could lead the world towards globalisation, internationalism and peaceful cooperation. I wish you will be able to give a speech to the world about peace as this coming New Year's greeting. Every deed results in a consequence and every person should get his or her wages at the end of their work. 'You work we benefit' is a communist mentality. Before British colonization, Burma had nothing: no proper education system, no suitable communication system, isolated from the rest of the world. When American people were celebrating their 111th year of independence, Burma became a colony of the British. With the help of the British, the Burmese were introduced to the Western concept of democracy. After independence, Burma became a parliamentary democratic country during which period Burma became like a tiger in the Asian region. But unfortunately, when dictator Ne Win took power, slowly it became one of the poorest countries in the world. Rohingya are not allowed to move freely from one village to another, or one township to another, or one district to another, or from the Rakhine state to the rest of Burma. The government places many restrictions on us to make our lives difficult that would not be accepted anywhere else in the world. All government officials, in particular the Rakhine, are specifically trained to discriminate, single out, oppress, mistreat, mishandle, neglect, overlook, avoid and disregard the Rohingya people. They act with all sorts of totally unacceptable and impatient behaviours, mistreating people in atrocious ways. These staff are recruited and assigned by tyrannical governors that are still widespread across the region. Such inhuman coordinated motivations humiliate, degrade and frustrate the entire Rohingya population before the eyes of all the other ethnic groups. In regard to movement restrictions, trade and commerce within the Rohingya localities has now reached level zero. Because of land confiscations, many more Rohingya farmers have been made landless and they are now forced to wander about the region. For the last 60 years, consecutive military governments have launched ethnic cleansing operations to remove the Rohinga people. Since the year of 1994 onward, some of the wandering people, who were jobless, homeless, uneducated and hopeless, often forced into criminality, frequently with chronic diseases, were recruited by secret agents who offered improved livelihoods in the Rakhine state. The military not only confiscated land but they also seized cattle and property owned by the Rohingya. The Rohingya were forced to build villages for migratory people and construct buildings such as pagodas, monasteries and roads without any compensation. Due to marriage restrictions, Rohingya people have to face a social penalty and pay fines from time to time. Although there are many ethnicities throughout the Rakhine state and the rest of Burma, no other race is restricted regarding marriage except the Rohingya people in the Rakhine state. We the Rohingya have been living under the shadow of fear and terror, oppression, exploitation, injustice, unfairness, prejudice, extrajudicial punishment, racial discrimination and other countless inhuman mistreatment, which are a combination of works from both Rakhine chauvinists and the Union government, for more than sixty long years in areas such as job employment, opportunities, health care, social work, land check points, steamer and boat ports, mountain passes, airports, immigration offices, municipal offices, revenue offices, education departments, farmlands, distributions and so on. Because of more than 6 decades long of oppressive ruling circumstances and regrettably, racially designed ethnic cleansing operations under several banners sponsored by the Burmese successive governments and aided by Rakhine ultra-nationalists, this has resulted in the forced exodus of more than one million Rohingya Muslims who sought refuge outside Burma, the internal dislocation of at least 2/3 million, and the death of another 100,000 as per the universal declaration of human rights. Whilst Rohingya people have been loving the Rakhine brothers and sisters as their own, few Rakhine nationalists from either part of the state have shown common respect, feelings of love, ample sympathy, communal understanding and equal recognition to the Rohingya people throughout history. Now it is time for Rakhine nationalists to learn. People such as politicians, historians, scholars, government staff, students, school teachers, open-minded monks and all community relevant dignitaries, must learn how to step closer to build constructive approaches as per the advice of international organizations and the dignitaries who have recently paid goodwill visits to Myanmar including the Secretary of State Hilary Clinton and Prime Minister Sheik Hasina of Bangladesh. Today the entire Rohingya people are afraid of being harassed, physically tortured, molested, and burned, looted and persecuted, and they fear their villages and belongings being set on fire due to the absence of fair security provided by the Union of the Central Government, where only Rakhine police are equipped by weapons in the Rohingya populated areas in Rakhine state. Since May 2012, the Burmese regime and Rakhine State authority have been continuously killing the Rohingya , burning their houses, looting their properties that caused 150,000 IDP refugees, and nearly one million people are now living under a blockade and are facing starvation. The regime implements a new type of terrorism, fascism, and Buddhist ultra-nationalism in the name of the democracy process. President Thein Sein opposed international humanitarian aids pointing to public desire as his excuse. The word democracy is being misused against democracy. With the votes of 60%, killing the 10% minority becomes legal according to Thein Sein's government. In the Burmese democratic process, thousands of Rohingya lives, properties, and rights have being sacrificed, and yet the Rohingya issue was the first issue which pushed international human rights activists to put pressure on the regime towards democracy. President Obama, you have the power of eloquence, intellectual and technical methods to solve this issue easily. As a world leader, I believe you could help resolve this issue and in doing so you would be a role model for the rest of the world. I personally beg you and your government to save the Rohingya people and help remove racism from Burma, which results in terrible acts both regionally and internationally. I believe the lives of the Rohingya in Arakan State are as bad as the lives of those in the concentration camps of Hitler. Could you please come and have a look at us? We believe that your visit could help change the course of world history especially in regards to Southeast Asian regional developments. Copyright notice: Please share and reprint this letter as you wish. I find myself a human rights activist. I never set out to be one. I just got so sick of seeing injustice in the world I decided to start speaking out and doing what I can to help people which has led me here. I live in the UK. I am also a web developer, which comes in handy when campaigning for justice. I cried with joy when you were first elected. Inspired like so many others, hopeful that you would bring change to the world. But like many others I also became disillusioned over your first term in office. I knew you had an uphill battle and couldn't change the world over night, but America's lack of support for Palestinian human rights and especially the people of Gaza has been more than disappointing. I cannot understand why Guantanamo continues to exist. And hypocrisy over Bahrain is so upsetting when I see my dear friends suffering daily under a cloud of tear gas on an island run by police thugs, suppressed by a regime you continue to excuse and even support. However, like many others, I'm ready to give you another chance. Yes you are not my president, I don't have a vote, but we all know that the President of the United States has the power to start wars, and sometimes end them. I figure you are less likely to bomb Iran than the other guy, so you would have got my vote. Your tears at your after party talk seemed sincere and touched by heart. We all need hope, its a powerful thing. I have renewed my hope in you. And I am not the only one who has put their hope in you. So has my Rohingyan friend in Burma. He is somewhere undercover, likely in a refugee camp in Sittwe, bravely gathering information from the ground and keeping a link open with the rest of the world via Twitter @aungaungsittwe https://twitter.com/aungaungsittwe He does so at great risk to himself, but he doesn't mind that. He tells me that he doesn't care if he lives or dies, to be dead in Hell he would not mind if he could see his people win their rights. I first got to learn about the Rohingya just this Summer. The apparent 'riots' had just begun in June, when a friend contacted me about their plight which she had learnt about through the fabulous grassroots charity Restless Beings based in London http://www.restlessbeings.org/projects/rohingya . She asked me if I could do something to help her help them, since she knew I was a human rights campaigner. I said if you want me to help, go find a source on the ground from whom we can learn the truth as to what is happening (kind of hoping she wouldn't come back because I really had my hands full with daily atrocities happening in Bahrain). But within a few days she came back with the telephone number of a Rohingya man living in Arakan state. He was a village leader who had been collecting information from all over the area. We interviewed him over a number of calls. He was living in fear, his village had run out of food and they had been eating green bananas, but even the green bananas had run out he told us. Children were dying of starvation. No one dared to leave their homes for fear that they would be killed. We were able to contact the World Food Program and pass on the information as to which areas were in desperate need of food, and they were helpful. But really no-one else was interested in our interviews which told of terrible atrocities that we were so shocked to hear. Amnesty told us they did not want the interview manuscripts as they already had so much information on Myanmar that they couldn't process it fast enough. News channels seemed disbelieving when we tried to report such atrocities were taking place. If your research team are interested to know more about those interviews some of our notes here. http://www.savetherohingya.blogspot.co.uk/p/interview.html One thing of interest to note is that our source stated that the police were burning the Rohingya houses and that suggestions that they were burning their own houses were a complete lie. It soon became apparent to me that what was happening now was an almost exact repeat of what happened in 1991 when the military Junta burnt thousands of Rohingya homes, killed hundreds and rounded up the rest into camps. It seems the motive then was to clear the land for new economic developments. I guess it was easier then to commit such crimes hidden from sight, without the Internet to worry about. But now we have the Internet, and social media, this becomes more complicated for such evil regimes to carry out their atrocities without getting noticed. Just before the last round of cleansing in June the military went door to door to confiscate digital equipment from the Rohinyga, but they didn't manage to get everything so some photos and video leaked out. This time around before October's houses were burnt the regime was much more thorough with their confiscation operations to prevent any digital leakage, which has resulted in very little new video coverage emerging of the atrocities as they were taking place, despite the wipe out being on an even bigger scale. But in 2012 the military did not need to carry out the violence themselves, as they did in 1991, but instead propaganda was widely distributed to brainwash the Rakhine monks and turn them into a killing machine which would perform tasks on demand, whilst the military stood and watched, and the government wiped their hands of the matter and professed their innocence. When looking at who is behind such crimes I believe it important to consider the history and the context. We can see that the Rohingya have suffered a series of clear serious assaults at the hands of the Burmese regime over a period of decades. A list of them is presented here: http://www.asiantribune.com/news/2012/11/03/letter-america-genocide-rohingyas-myanmar-%E2%80%93-part-1 In addition, there are major economic developments planned for this area. It came as no surprise for me to learn that Burma has a new oil and gas pipeline due to open in 2013 to take resources from the Bay of Bengal and also shipped from the Middle East up to China. The pipeline starts in the Arakan state, which is where the Rohingya clearance has been taking place, and passes over to the Kachin state where other human rights violations are also occurring http://www.hrw.org/news/2011/10/18/burma-army-committing-abuses-kachin-state . This document gives a lot of detail regarding the dealings of the oil companies involved : http://www.banktrack.org/manage/ajax/ems_dodgydeals/createPDF/shwe_gas_and_pipelines_projects and further information can be found here http://www.arakanrivers.net/?page_id=139 I also read that India (ONGC) and China (CNPC) were working together on the pipeline, alongside other 'exploration and production' operations taking place in the Sudan and Syria. http://blog.project2049.net/2012/07/sino-indian-energy-cooperation-in-burma.html But it seems not only India and China have a stake in this pipeline, other nations do also. Ban Ki-moon stated that it was a 'win win' situation for everyone. http://www.mizzima.com/news/world/4039-ban-ki-moon-called-burma-gas-pipeline-a-win-win.html What did he mean by that? This is certainly not a winning situation for the Rohingya, or do they not count? What is clear to me is that planned and well organised ethnic cleansing has been taking place, and with the Arakan state still under military control since the state of emergency took was declared in June, there is no way that this could have happened without military complicity. At best, this violence could have been easily prevented by the military had they so decided. I also understand that the Burmese only care about human rights when it is good for business. The release of Aung San Suu Kyi and her subsequent world tour was we all know to buy political favour, and didn't it work well! Whilst she was dazzling people with her smile the operation to remove the Rohingya began. It was suggested to me that the Burmese idea of democracy is ASSK and the military Junta putting on suits. I believe that was a perfect analysis. President Obama your visit to Burma later this month comes at a key moment in time. If business is to take precedence over human rights this will be the last green light that the regime were looking for and they will complete their plan to get rid of their problem without further delay. However if, and only if, the USA lay down the line, that human rights come first, and will not be compromised however great the business deal, then things will change. All rests now on your shoulders Mister President. The future of an entire race. Maybe this meeting will chart the route of future history. Maybe a stand for human rights now will result in the avoidance of the creation of a new and unstoppable Nazi regime. With half of the revenues of the oil pipeline heading the way of the military Junta, and the other half to China, surmounting to many billions of dollars, I dread to think of the future impact of such a regime. The Rohingya urgently need protection, by an independent peacekeeping force. They need urgent access to aid and medical care. And they need the return of their citizenship which was stolen from them by the dictatorship in 1982 and never returned. It has been reported in the media that a new census is taking place in a move towards granting citizenship to the Rohingya. However my Rohingya friend in Sittwe tells me that what is actually happening is that Rohingya are now being tortured into signing that they are Bengali not Rohingya, and some are even tortured in public as a deterrent for others. Those that refuse to sign are being arrested and driven away (clearly for more torture, probably never to be seen again). Just today he told me that people were even arrested and taken away by police from a refugee camp when they refused to sign. I learnt through it that genocide is always caused by politics, and I understood that it can be stopped, although it happens over and over again. It takes place as a result of a series of decisions. Please watch this documentary. It is long but is may be the best documentary I have ever seen and if its advice is heeded thousands of future lives, or maybe millions, could be saved. Please let this be your defining moment as a truly great man that stopped a genocide, where many others have failed. For my Rohingya friend Aung in Sittwe, a true hero of this world, you are maybe his last hope. Please don't let him down. Thank-you for reading. May God grant you wisdom and bring you guidance. Please also read this letter to Obama from Aung the Rohingya refugee. On Thursday 8th November the previously voiceless Rohingya did an amazing thing and protested from inside a refugee camp in Sittwe, Burma and tweeted their photos for the world to see via @aungaungsittwe. In doing so they joined other protests taking place around the world, led by the UK based charity Restless Beings. IMPORTANT CLARIFICATION: It has been misreported in the media that this crisis is sectarian clashes. There are NO clashes, the violence is all one sided, this is ethnic cleansing backed by the police, with hatred whipped up against Muslims through state supported propaganda and this has been clearly stated by excellent independent sources on the ground. Please try to convey this message. NOTE - as of 1st October one of the important news sources which is listed below had its website suspended. Any links below for news.mmsy.info do not therefore currently work. I am trying to find out more about this and will leave the links below as the headlines themselves are important. Best video coverage yet on the conflict. Watch to the end. Children are dying now from starvation. Thousands are being starved to death out of sight. Village of 7,000 surrounded by armed gang of 10,000. UK government don't appear to be doing anything and clearly have full confidence in the Burmese government. Rakhine youths have apparently been shipped in to Maungdaw and armed. Now the Rakhine have put out a message to transport all refugees to Maungdaw also. This is a very worrying development. Update from village still at risk of attack. Tension building. 6000 villagers surrounded by killers waiting to die put out a desperate plea for help. Approximately 400 dead in Yan Theyk Village, Mrauk U Township killed on 23rd October. As of 28th October many more villagers there will now die without rescue. A courageous lieutenant general realizes what is happening to the Rohingya and speaks out, but will anyone listen? Kyauktayan village was under the threat even after the inspection of Lt. General Hla Min. List of instigators of violence given here. Army general visits village to critisize instigators of violence, then armed gangs gather to attack village next door when general leaves. Army trying to protect village. Problem of access to emergency healthcare. Reports of petrol attacks, torching of another village.Little food and drink in camps. Scores injured without medical assistance. Wira Thu is one of the monks said to be propagating hatred towards Muslims, and is also said to be working for the government. A really dire situation, just got worse. With many boats stranded at sea HRW suggests that India should do the right thing in providing shelter and pushing other governments to also. In Pauk Taw 7,000 given until morning to leave field or be killed. Another 3,00 stuck in another field. 15,000 seeking shelter. 2 mosques bombed in Karen state. Refugees not getting aid. Global day of action on 8th November. 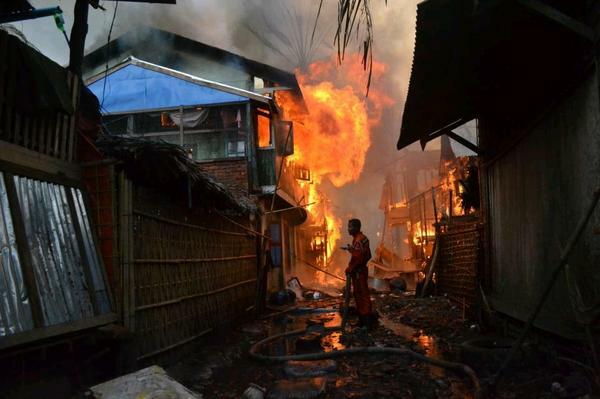 Pauktaw Townshipn which contains 1,200 homes is ablaze. 53 bloats landed at Ohntaw (Bariza Para). 12 boats with 2,000 refugees landed at Tae Chaung of Akya where they have no aid and are surrounded by boarder police who are abusing them and starving them to death. Rakhine youths are being brought in to Maungdaw Township and armed to kill Muslims. 21 boats were at sea 5 days without food or drink. Mothers gave birth on boats and died with their babies. Bodies thrown into sea by military. 14 boats allowed to land, 7 taken away by Navy location unknown. 100 died trying to defend mosque in Pike Seik Quarter in Kyawk Phyu. Boat carrying 100 Rohingya refugees makes it to Thailand waters but is not allowed to land. A bell was rang before petrol bombs were thrown on their homes. Firfighters doused homes with petrol. Although Turkey is sending aid it is very hard to deliver this to the Rohingya people. Expect much of this aid to feed the mouths of the killers, that is what has happened with much aid previously delivered. Village at Yangon Thin Gan Gyune has been issued an arson attack warning, message delivered to a school. 60 kids left behind fate unknown. Four boats destroyed. Border police torching houses. Rakhine attacking with guns. 'We deplore the latest spate of attacks which has caused many casualties, left tens of thousands of people displaced'. Unusually accurate reporting from the BBC. Listen carefully. Desperate plea from Rohingya organisations around the world. Confirmation of report that firefighters doused flames with petrol, and police and army backing of crimes. Brave villagers seek to give refuge to 3,500 arriving in boats but they risk attack on their own village to do so and do not have enough food to feed everyone. These refugees are waiting to die. Translated status report of crimes from previous day. "26th October am: multiple boats, which included some dead woman and children, with ~8000 Muslim survivors from KyaukPyu assault came ashore in Maungdaw South. International relief teams responded with many trucks full of relief supplies and provisions but Military Border Forces prohibited any of this relief from reaching these survivors. Border forces allowed only 4 boats ashore while photos were taken of Border Force showing assistance. The remaining boats, which included dead women and babies, were rerouted over 40 miles up the Naaf River to Taungbro, which is ~100 yards from Bangladesh where there is no international relief." "Though Rakhine Buddhist civilians and monks have threatened anyone giving aid to Rohingya, international relief and local Muslims has responded to large number of boats with as many as 10,000 Muslims escaping from at least Kyauk Pyu...landing in Sittwe and Maungdaw South with dead babies, children and women included. 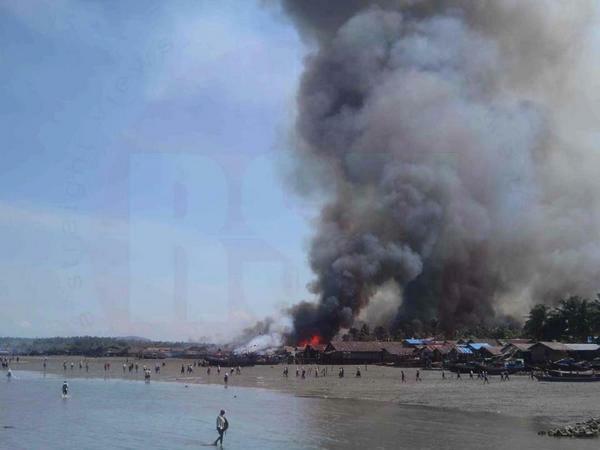 Many boats havebeen turned away by Rakhine Buddhists in Sittwe." Newly born baby + mother shot. 10000 adrift at see. Mass grave 200 bodies discovered. State sponsored ethnic cleansing. Confirmed reports of hundreds killed. Mass grave with 200 buried. Burmese government complicit in a “final clearance of the Rohingya people”. 5000 to 6000 refugees with nowhere to go,, including woman in labour, starving to death. Not just Rohingya Muslims but Kamam Muslims too are now being removed. When even the official government spin doctors are announcing a death toll of 112 in 5 days you know something very serious is happening. Of cause for alarm is a state government announcement that the authorities would not allow more evacuees to enter the city [of Sittwe which is where all the boats of refugess were heading, the only place they had to go]. The USA have pledgede $2.73 million for displaced people in the Arakan State. I guess that would build a nice house or two in the USA. Whilst the Rohingya were being massacred on Thursday, US officials were meeting with Thein Sein to discuss trade and the removal of all economic sanctions. 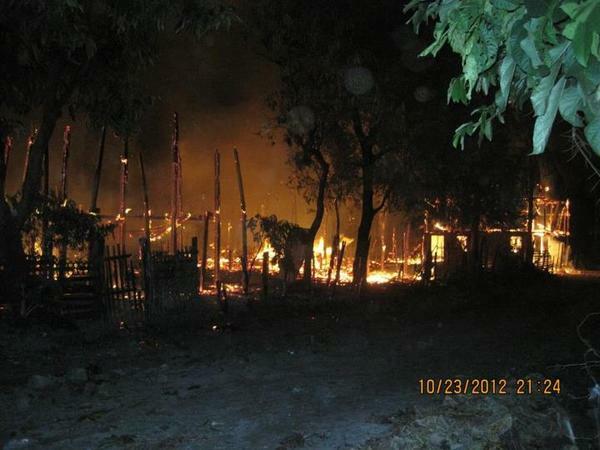 4 villages burnt at 12.30am. Thousands homeless fled to sea. 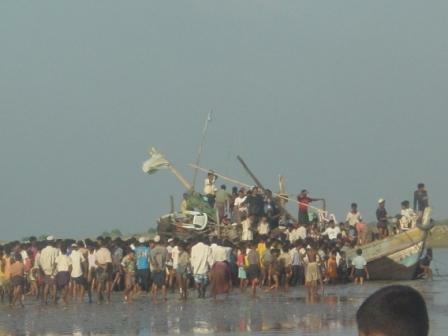 Boats told not to land until they reach town where Rakhine are waiting to kill them. People in boats adrift at sea for days without food or drink. Reports from 5 townships and sad news that 3 of RestlessBeings sources have also been killed in Burma. Two Rohingya callers report. 90 herded into boat then men shot women raped. 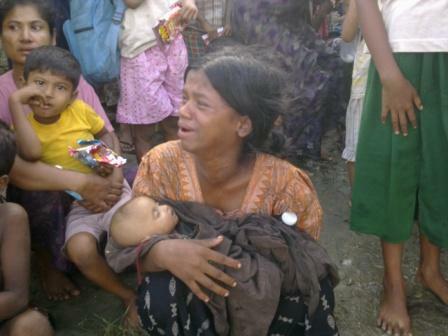 1000 fled into mountains around Sittwe. Noone left in Muslim quarter. 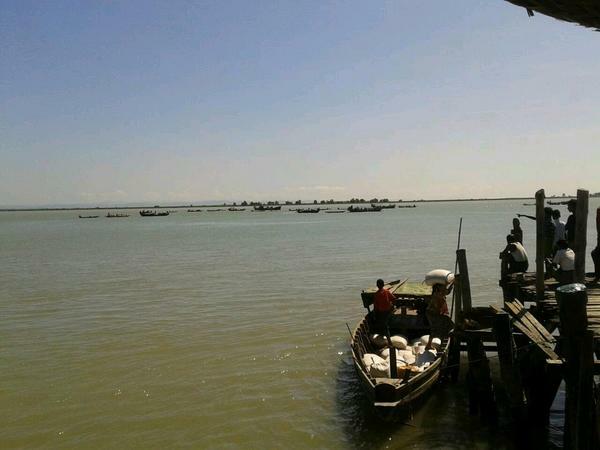 All heading to Sittwe in boats, or killed, with weapons such as machetes. Eleven admitted to hospital. More than 800 students joined a rally to call for an end to “studying with terrorist Bengalis” and for the removal of Muslim villages on the road to the university. Refugees fear death by starvation.Reports that Police Chief Thar San is leading the killing. At 6:30 AM, Rakhines have started burning down houses at Lat Saung Kaut village. Those fleeing the area were shot by the Rakhine Army. local witness reports 7 deaths. 3 ferries reported as attacked the previous day, and victims including women chopped up. One 10 year old boy escaped. Burning of 20 houses began at 5.30am whilst Muslims praying in the mosque. Two shot dead, one seriously injured. Interview with guy in his boat who reported 7000 were at sea trying to flee the violence, chased out of their homes by Rakhines with swords. All homes burnt. He saw 3 youths shot dead. Reports of firefighters arriving with tank full of petrol instead of water to put on blazing homes. Pauktaw: Men slaughtered in front of women and children in river, young boy espaped. Kyauk Phyu: 600 killed trying to escape by boat. Mre Bon: 600 homes burnt, deaths unknown. 3000 peoples' homes burnt to ground. 100 corpses floating after boat overturned just one 13 year old escaped. 1300 stuck on river bank got just a few hours to escape or be killed. More than 15,000 floating in boats fate unknown. Rakhines planning to kill the people in the boats. In Minbya, the only remaining Rohingya village, Lombaichar, has 850 Rohingya homes which are now completely encircled by a 7,000 strong Rakhine force. 2000 remaining Rohingya do not expect to see sunlight. Other than death, other options seem completely unlikely. Eyewitness account of approximately 100 + 350 women and children + 200 (total 650) slaughtered, 600 + 100 + 600 homes burnt (total 1300 homes), plus people jumping in river with nowhere to go. Eyewitness reports, people chopped up with swords, women and children put on boats but Navy threaten to shoot them. Fire on four sides, people with nowhere to go. Rally gathering now in Sittwe. 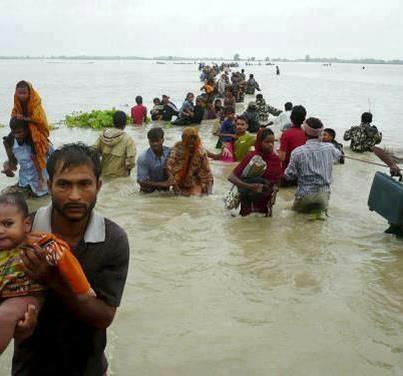 100 feared dead, 26 raped, 200,000 stranded in homes with nowhere to go. Write to Catherine Ashton vice-president and high representative of the European Union for foreign affairs and security policy. Tell her it is not acceptable that the EU is strengthening ties and dropping sanctions with a country whose government is ethnically cleansing part of its population. The Rohingya Muslims have been living in Bangladesh for hundreds of years. Their citizenship was removed in 1982. They are denied many human rights including the right to get married. Thousands of their homes have recently been destroyed by fire. Hundreds have been killed by police instigated violence and thousands are now homeless, in hiding, in desperate need of food and medical assistance. An article published by the Anadolu Agency on 22nd July states that the EU 'is making diplomatic initiatives so the massacre of Rohingya Muslims in Myanmar ends', but we could find no such evidence of this elsewhere or on the EU website. Whilst the world media obsessed over the distraction of Aung San Suu Kyi, quietly ignored back in Burma 90,000 people were displaced from their homes, which were burnt to the ground, in a mass act of genocide (disguised as sectarian strife) against the Rohingyan Muslim people. The whole world it seems can't wait to get into Burma, to do business, and a major new gas pipeline is being built from the Bay of Bengal across to China due to be finished by 2013, which may or may not be adding to the excitement. Many of the Rohingya tried to escaped with their lives by taking to sea, only to get turned back at the Bangladesh border. Some boats disappeared. Others were reported to have been shot from helicopters and destroyed. Now we have a source on the ground who told us everyone had run out of food. Good news is that as of today, 20th July, we have learnt that some food is now getting through to the Rohingya, distributed by the WFP, but many thousands are still hungry and in desperate need. In addition our source says more medical assistance is urgently required as there are many injuries and sick people. We have been told that there is some medical help but more is required since people are dying every day from injuries and disease. These people desperately need protection, food, medical care and homes rebuilding, as quickly as possible. This requires money. We would like to be able to help raise funds for the Rohingya so we have been writing to DEC to ask them to launch an emergency appeal. The problem is that DEC will not launch an appeal until the main stream media has been reporting the crisis for a number of days. On Monday 23rd July Restless Beings are holding a press conference on behalf of the Rohingya people to raise awareness of the current crisis. It is important that all the UK press attend. Please write and tweet to them all, and ask them to send someone to the press conference to give this mass act of genocide the urgent coverage it should be getting. We have listed some news sources below for you to contact, but you may wish to contact more. Please also write and tweet to the UK government who should also be sending someone to the press conference to find out more and voicing this issue as a matter of urgent and grave concern. We have listed some details below but if you live in the UK please also contact your own MP. Update: The BBC finally gave a bit of online coverage to the crisis on 20th July here but it was sadly lacking in detail of easily verifiable facts (such as 90000 displaced and hungry, and thousands of homes burnt to the ground). Write to the BBC ask for urgent detailed television coverage on the Rohingya genocide and ask them to attend the Restless Beings press conference in London 23rd July. Write to the Sky News ask for urgent coverage on the Rohingya genocide and ask them to attend the Restless Beings press conference in London 23rd July. Write to the the Daily Mail ask for urgent coverage on the Rohingya genocide and ask them to attend the Restless Beings press conference in London 23rd July. Write to the Independent and ask for urgent coverage on the Rohingya genocide and ask them to attend the Restless Beings press conference in London 23rd July. Write to the the UK government ask them to voice urgent concerns about the genocide of the Rohingya in Burma and ask them to attend the Restless Beings press conference in London 23rd July to find out more about the current situation on the ground. If in the UK, contact your MP. When you have completed these tasks please tweet to the #SaveTheRohingya tag to tell everyone and also paste to Facebook to ask others to do the same. Please also tweet @SaveTheRohingya with your progress. If we all act together we may be able to get the Rohingya the help they desperately need! Please check back tomorrow for day 3 of actions. If you missed action 1.5 it is here - please do that too! Wondering what this is all about? You can read about the launch of the campaign and what we are doing here.